Craft a Scene: Craft a Scene Hills and Mountains Winners! We had really wonderful "Hill and Mountain" scenes to enjoy this month. We had a wonderful variety between linked projects and email (4 of them) projects. It is always tough to choose the top 3! 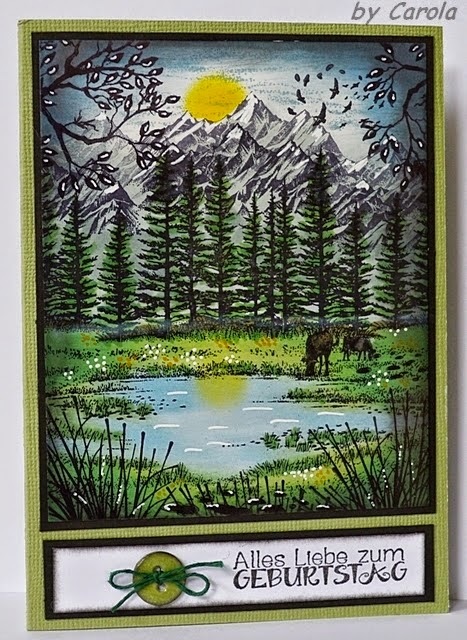 I also find it difficult to limit myself to just three top entries as there are so many really wonderful scenic stampers who enter this challenge. Be sure to take our badge to add to your blogs (if you have one). Here are the selections for the top three for April. Wowser! Thank you so very much, am honoured! Also thanks to you and the DT for your hard work! Vielen Dank für die Top 3....thank you. I am happy. Glückwunsch auch an Karen und Scrap Affair.